Good morning! Today is the Crafty Secrets "Party" Theme DT Challenge. 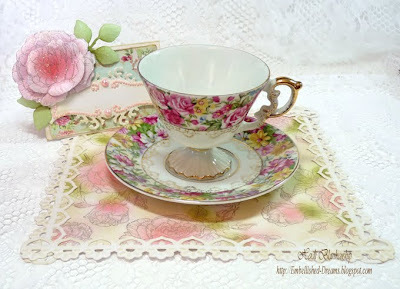 I designed a sweet little ensemble for a tea party. 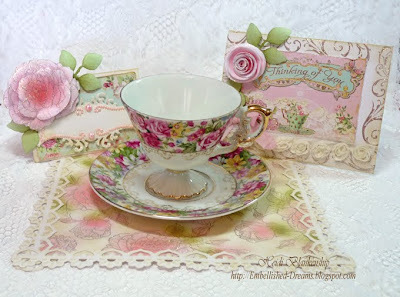 I created a a place mat, a place card and a card that could be sent for an invite to a tea party. 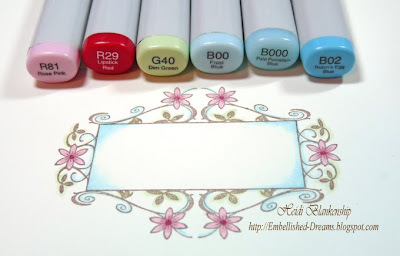 For the place mat I started with a piece of 8 x 8 white cardstock and randomly stamped the rose image from the Roses Clear Art Stamps from Crafty Secrets using Rich Cocoa ink. 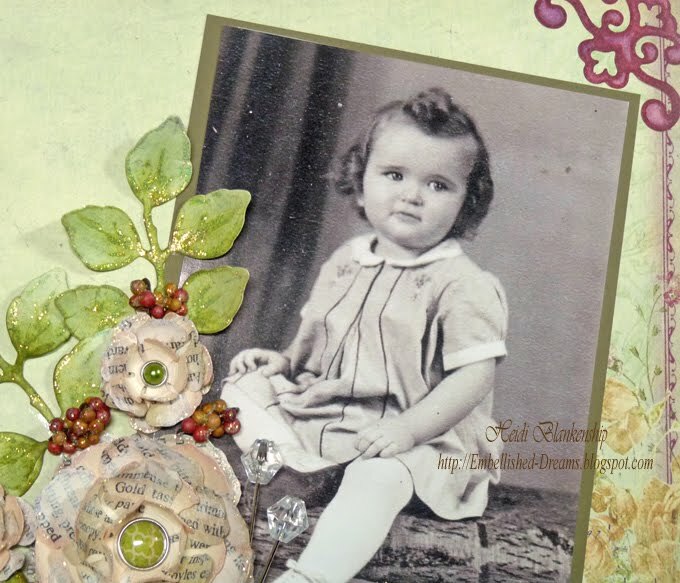 Then I colored the roses and leaves using Spun Sugar, Worn Lipstick, Shabby Shutters, Forest Moss and Antique Linen Distress Inks. 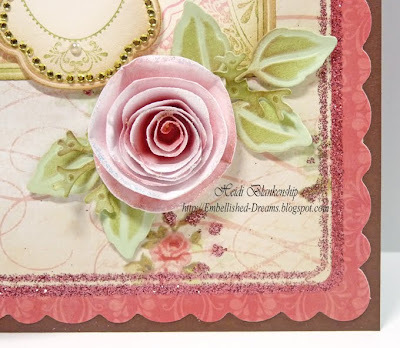 Then I added a border using S5-040 Floral Doily Accents from Spellbinders and then I added Diamond Stickles to all of the roses. 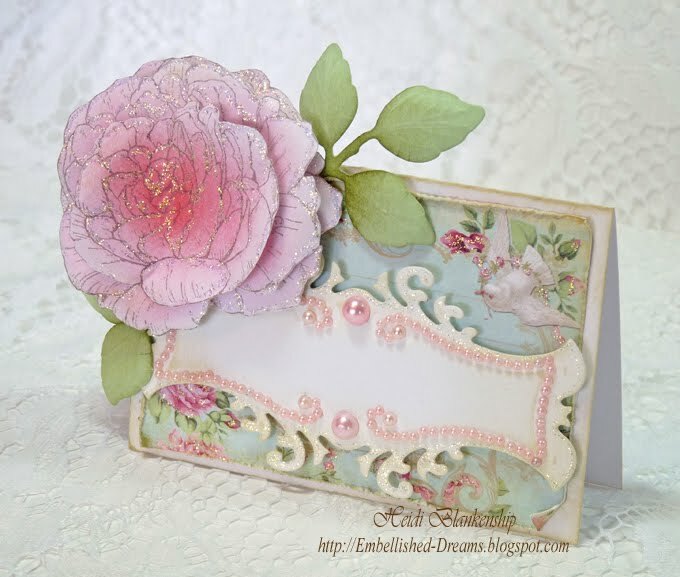 For the place card I used an image from Love Mail Creative Scraps from Crafty Secrets and the Roses Clear Art Stamp. 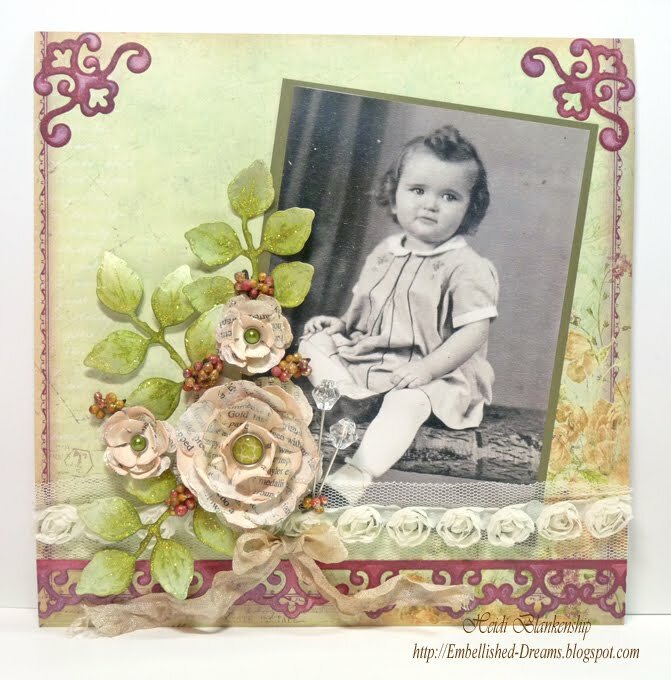 I distressed the edges of the image and added Diamond Stickles to the flowers on the image. Then to create the rose I stamped the image three times, inked it to add color and then hand cut the flower making the center piece smaller. I layered the flower and then added Diamond stickles. 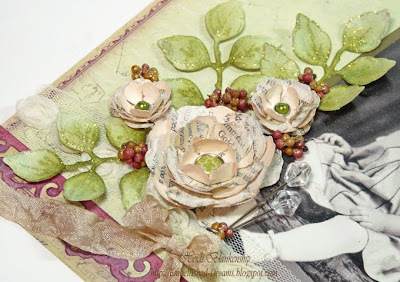 I used S4-328 Foliage from Spellbinders to create the leaves for the rose. 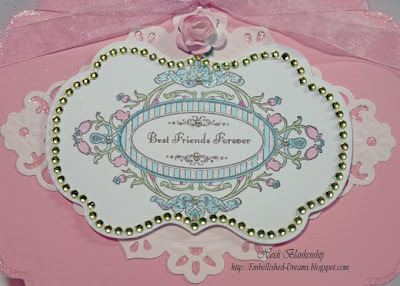 Next I cut/embossed a tag using S5-030 Fancy Tags Two, inked the edges and then added Fancy Tags Two Pink Pearl Nestabling from Want2 Scrap. I also edged the tag with stickles. Here is a close up of the place card. 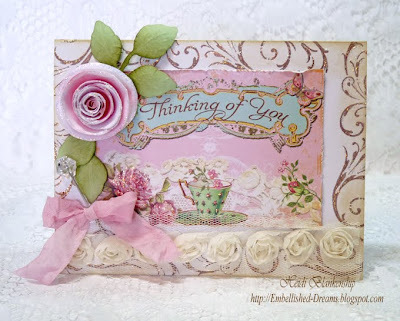 For the card I used another image from the Love Mail Creative Scraps. I love the images on the Love Mail Creative Scraps they are SO beautiful!! 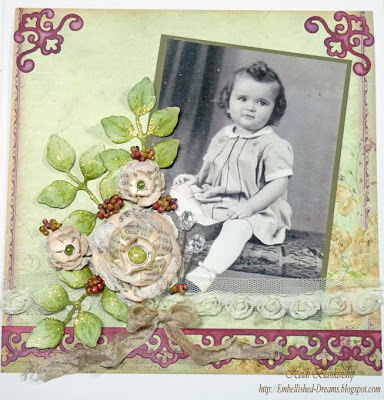 I distressed and inked the edges with Antique Linen and added stickles to the flowers. 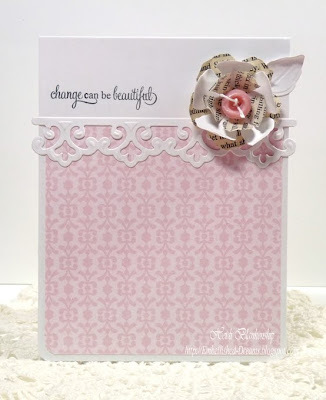 I stamped flourishes around the outer edges of the card using the Cherubs Clear Art Stamp from Crafty Secrets and added stickles. I used S4-312 Blossom Three to create the rolled rose and S4-328 Foliage from Spellbinders for the leaves. I added some rose ribbon trim and a antique gem trinket pin from Maya Road. I also added a little bow using hand tinted crinkle seam binding. 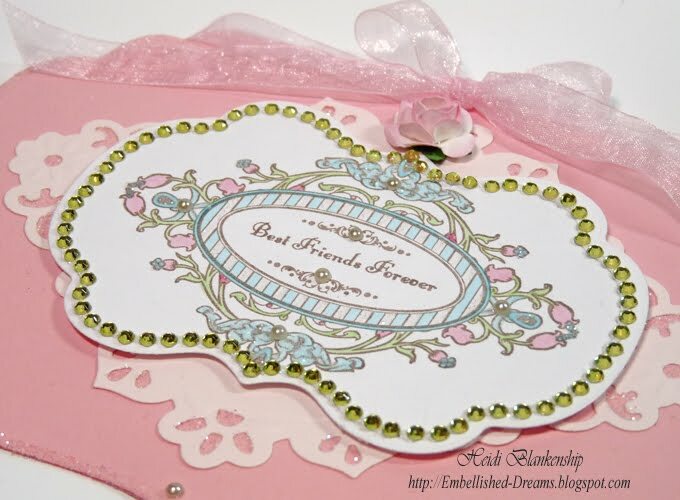 Please be sure to take a little time and visit each of the Crafty Secrets Design Team Members to see what they created for their "party" theme. Thank you so much for stopping by today and I hope you have a Fantastic day!!! Good morning! Today, I have some exciting new to share with you!! For the month of March I will be the Guest Sketch Artist for Skipping Stones Design!! 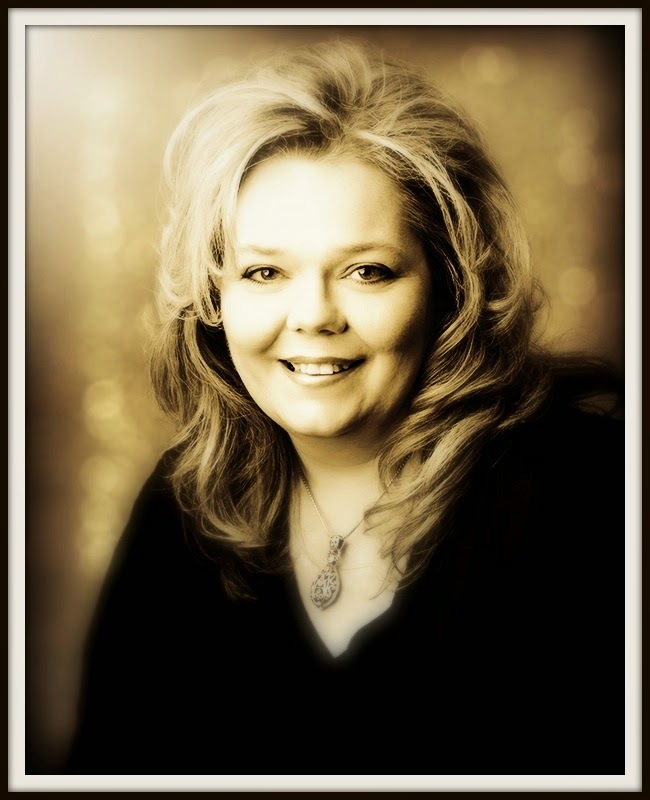 I was so excited and honored to receive a message from Heather Engebretson asking if I would like to be a Guest Designer!! Now, I will be honest with you designing the sketches is still something very new to me but I love the challenge and I am having fun with it! Please be sure to check out the Skipping Stones Design Blog to see the other wonderfully talented ladies that will be joining me this month as Guest Designers for Skipping Stones Design. Thanks you so much for stopping by today and be sure to stop back in just a bit---I will have two posts for today---today is the Crafty Secrets Design Team Challenge and this month we have a "party" theme--you won't want to miss it!! Before we get started with our Simply Sunday post we would like to say Thank You so much to all of you for your wonderful comments and emails last week for our first Simply Sunday post. We had a few inquiries with people asking to be added to the blog roll for Simply Sundays and at this point in time we are not going to be adding links to other blogs. Simply Sunday is something that we want to keep as simple as possible and we wanted to personally challenge ourselves with creating simple cards and to share them with all of you. However if you decide that you would also like to take on this challenge of creating simple cards please leave a link to you blog or gallery so we can see what you created. Also by leaving a link on one or all of our blogs other people will be able to click on your link and see your creations too. To find out all of the details about Simply Sunday please see the side bar. We would love to have you visit each of our blogs. Hello! 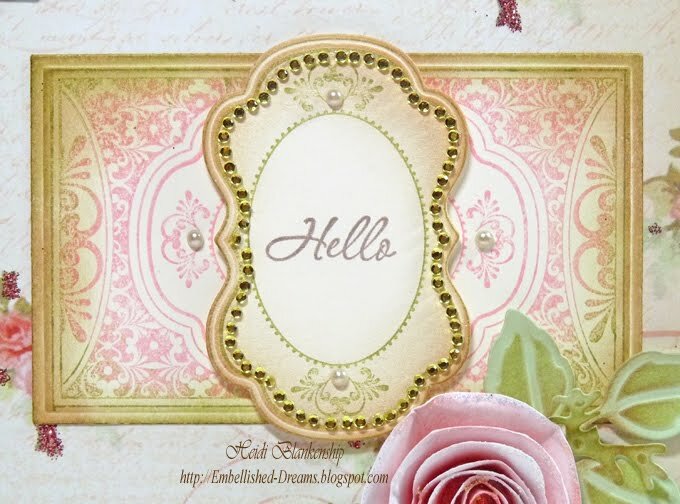 Today, I have a layout to share with you using the S5-050 Rose Creations, S4-328 Foliage, S5-034 Parisian Accents (border) and S5-035 Parisian Motifs (corner accents) all New Releases from Spellbinders™. This is one of those layouts that just came together so easily and I am so happy with how it turned out. The little girl in the photo is one of my great aunts when she was about two years old. I think the photo is so adorable! 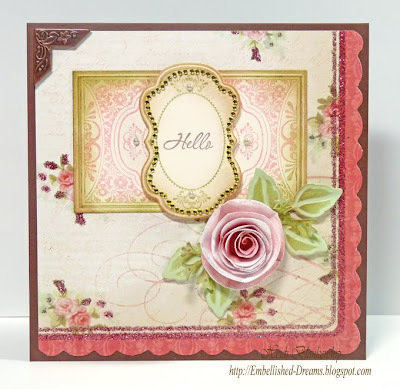 I used S5-050 Rose Creations and S4-328 Foliage to create the floral spray on the layout. To create the roses I used old book pages and dry brushed them with antique white paint and then inked the edges with Spun Sugar and Antique Linen Distress Ink and I cut petals from ivory cardstock and inked them with Tattered Rose Distress Ink. I shaped the flowers, layered them and added My Mind's Eye Stella and Rose Hazel "Lovely" Decorative Brads to the centers. 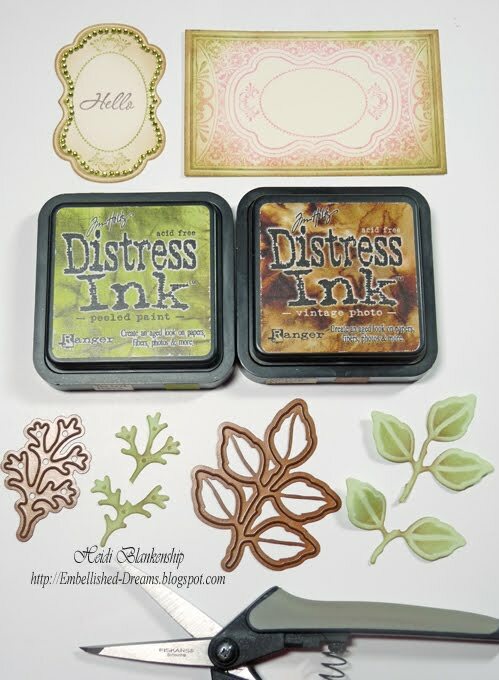 For the leaves I used Prima Botanical Collection paper and inked them with Forest Moss Distress Ink. I edged the flowers, leaves and berries with Diamond Stickles from Ranger. Along the bottom I added Maya Road Small Cream Roses Organza Ribbon and a couple Antique Gem Trinket Pins. 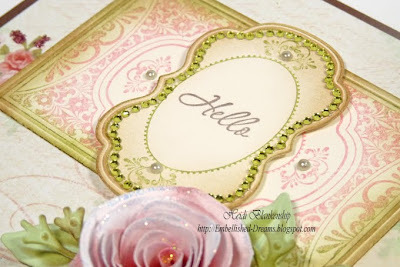 Then I created a border using the Grand Calibur™ and S5-034 Parisian Accents. On the border and corner accents I used the Reverse Stencil Technique and inked the inside of the die templates with Clearsnap Color Box Pigment Merlot and then cut/embossed using the Grand Calibur™. Then I inked over the entire piece with Dusty Concord Distress Ink to achieve a reddish plum color to match the edges of the Prima Botanical Collection paper that I used for the background. I also added a few berries and some hand tinted crinkle seam binding. Thank you so much for stopping by today! I hope you are having a Fantastic weekend!! Don't forget to stop back by here tomorrow for Simply Sunday (see sidebar). Good morning! 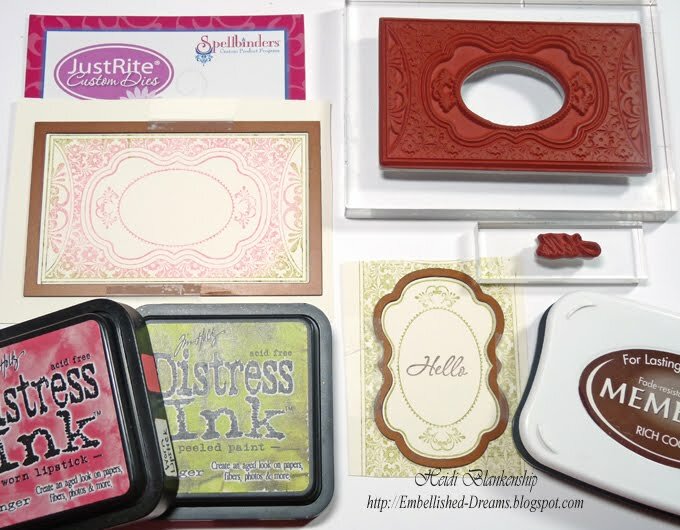 Today, I have another fantastic New Release from JustRite Stampers to share with you! Here is the card I designed using the NEW JustRite Stampers JustRite Cling CL-02105 Elegant Frames. 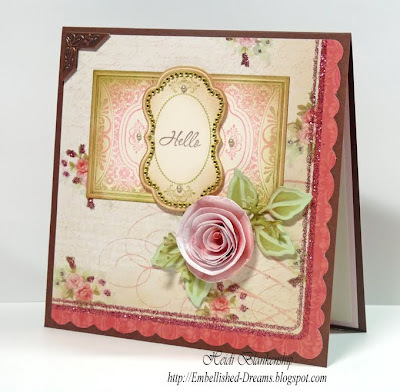 This stamp set includes 3 Designer Frames, 2 Accents and 6 Sentiments. I love all of the beautiful details in this stamp set!! 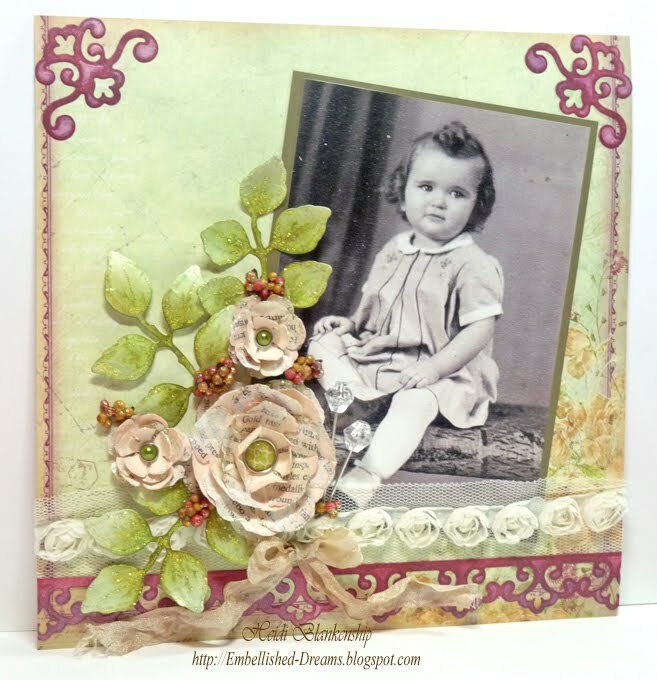 To start I stamped both of the larger frames from CL-02105 Elegant Frames. I stamped the larger frame on to Simply Smooth White cardstock using Brilliance Starlite Silver ink and then dry embossed the image. 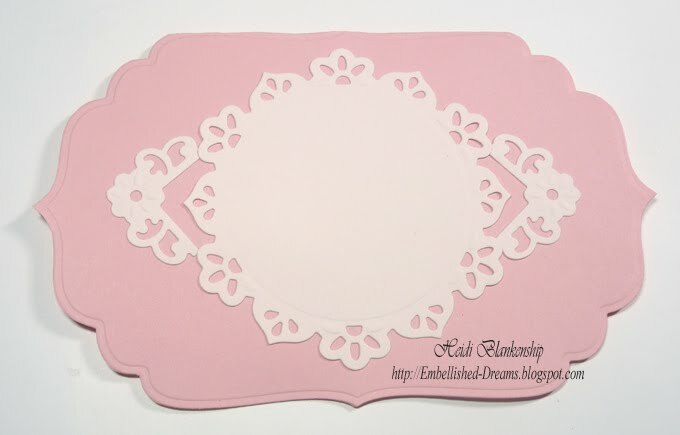 Then I cut/embossed the frame using the Grand Calibur™ from Spellbinders™ and JustRite Custom Dies JB-08950 Nested Frames. For the smaller frame I used Versa Magic Aloe Vera ink. 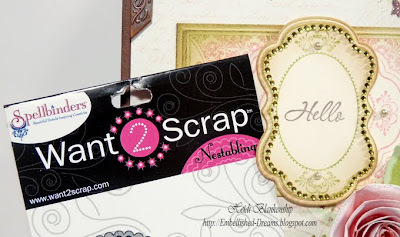 Then I used S5-027 Labels Twenty-One #3 and the Grand Calibur™ from Spellbinders™ to cut/emboss the frame. I used the little twig leaf die template to cut/emboss a couple leaves. Here is a close up of the two frames layered together. I edged each of the frames with Tuxedo Black ink and then used 3D Foam Sqaures from SCRAPBOOK ADHESIVES By 3L™ to layer the frames. Then I added some green rhinestones from BoBunny. 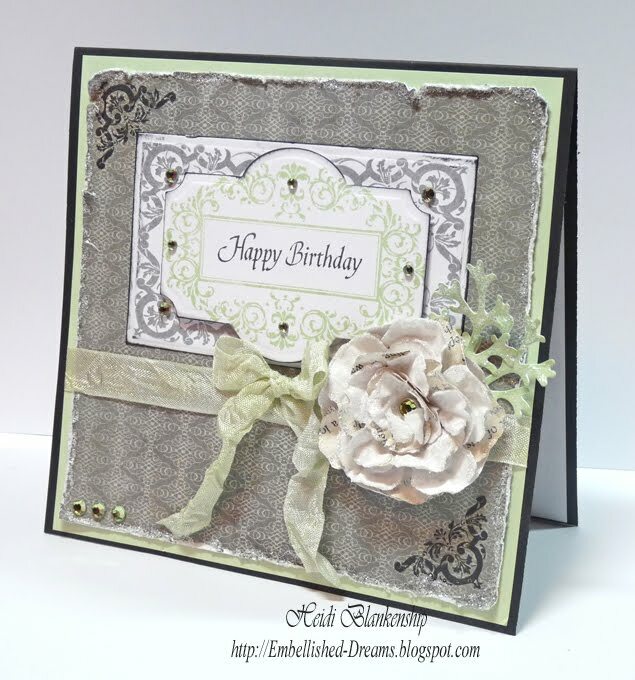 Here is a close up of the flower with the leaves and the corner accent stamp from CL-02105 Elegant Frames. To create the flower I used White Floral Print Fabric, Simply Smooth White cardstock and Old Book Pages. 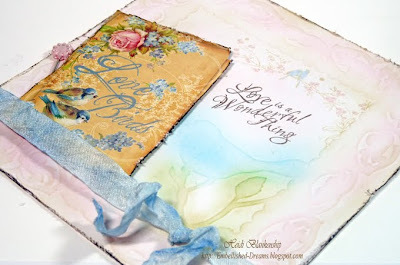 I used the Grand Calibur™ and S5-050 Rose Creations from Spellbinders™ to cut the fabric, cardstock and old book pages. 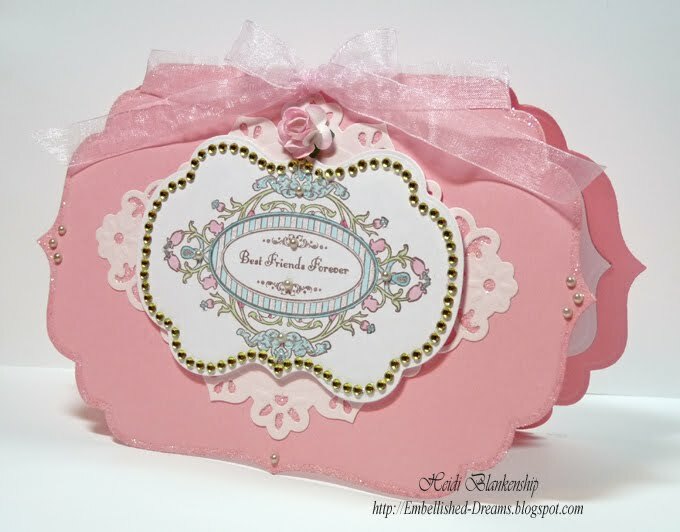 I used three different sizes of the S5-050 Rose Creations die templates. Next I dry brushed antique white paint on the flowers cut from old book pages. Then I used Stiffen Stuff from Beacon Adhesives on the fabric to shape it. I brushed glitter on the white cardstock and shaped them. Then I layered the flowers and added a brad to the center. I added a bow with hand tinted seam binding. 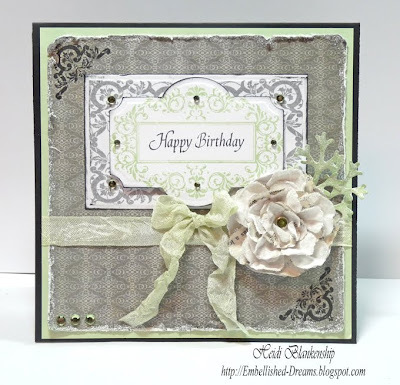 I added stickles to the edge of the flower, leaves and edges around the card. 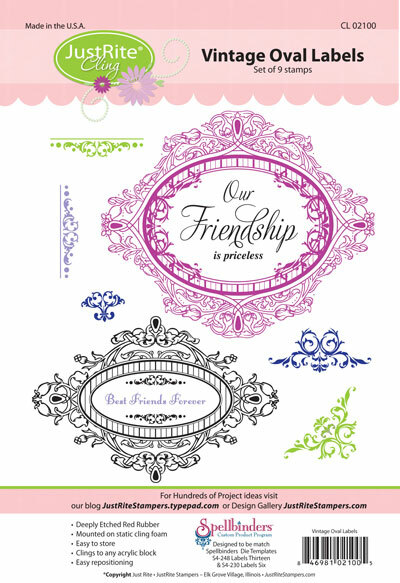 Please visit some of the JustRite Stampers Design Team Member's to see the creations they have to share. Good morning! Today, I have a card to share with you using the New March Release Heart to Heart from JustRite Stampers. 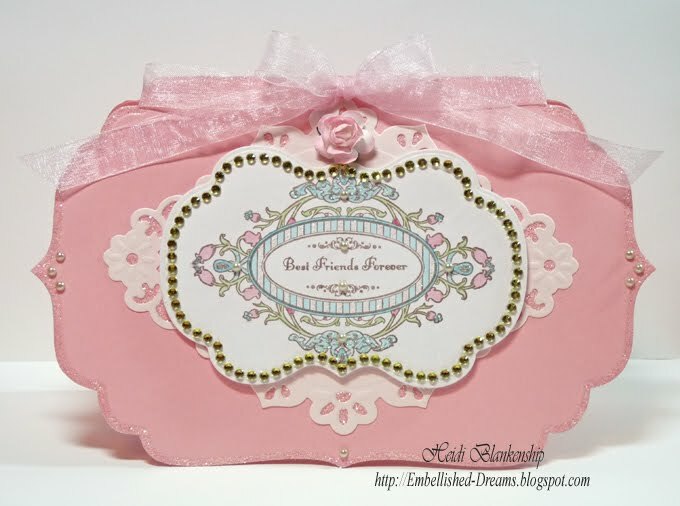 The Heart to Heart stamp set is a JustRite Original and the set includes 4 Designer Centers and 4 Interchangeable Borders. 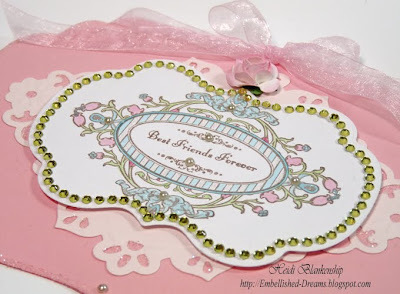 I love the classic sentiments and the borders have beautiful detail! 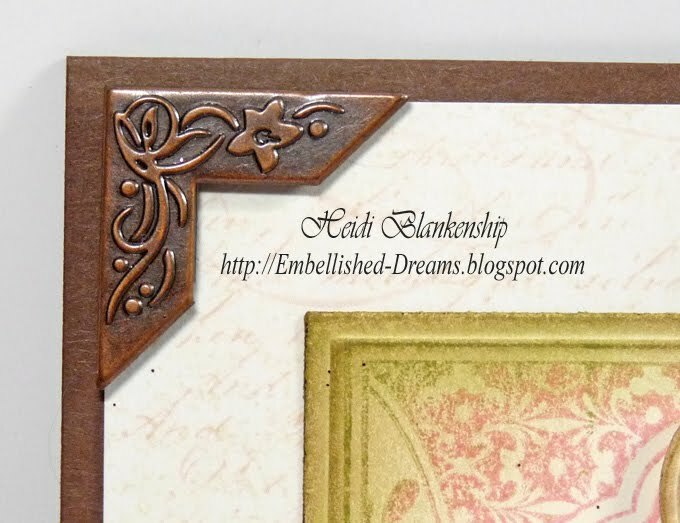 To start I stamped the border from Heart to Heart onto Simply Smooth Ivory cardstock using Rich Cocoa Ink. Next I colored the border with Copic markers. 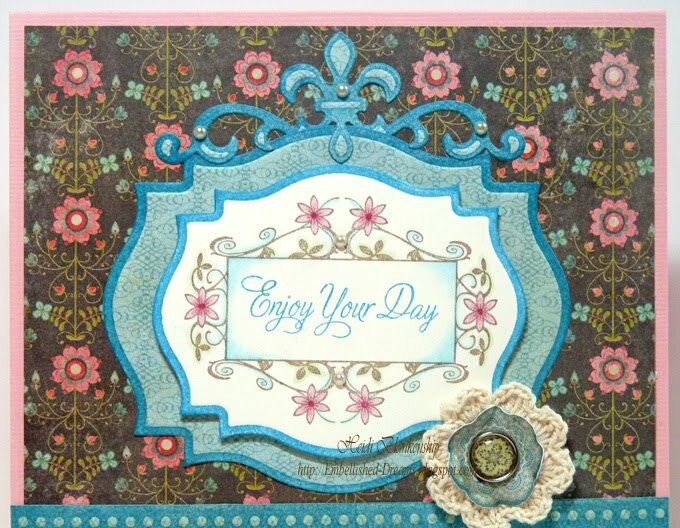 I used Dusk Blue ink to stamp the sentiment and do the reverse stencil. To do the reverse stencil ink the inside edges of the die templates and then cut/emboss. 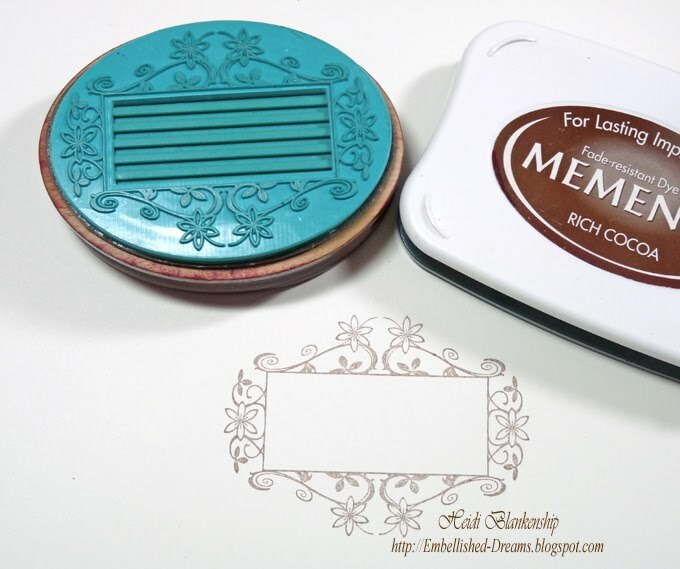 I used S4-310 Labels Eighteen #4, #5 and the Grand Calibur™ from Spellbinders™ to cut/emboss. 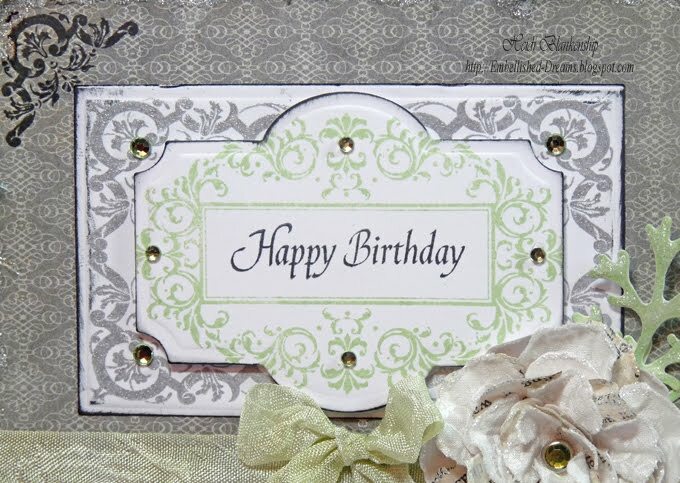 Here is a close up of the card front. 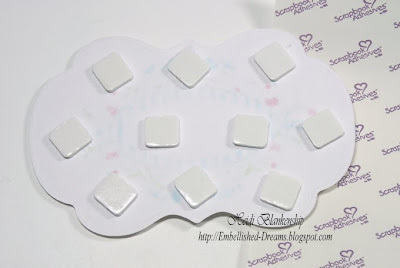 I used 3D Foam Squares from SCRAPBOOK ADHESIVES By 3L™ to pop up the center image. 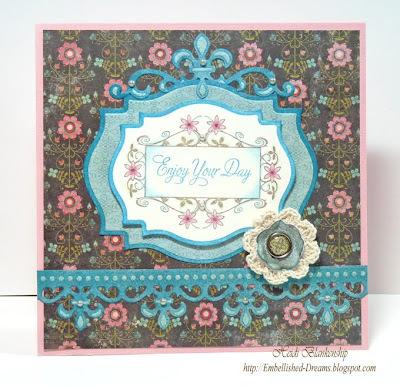 The background paper and paper used for the label, border and accent piece are from the NEW My Mind's Eye Stella and Rose Hazel Collection. 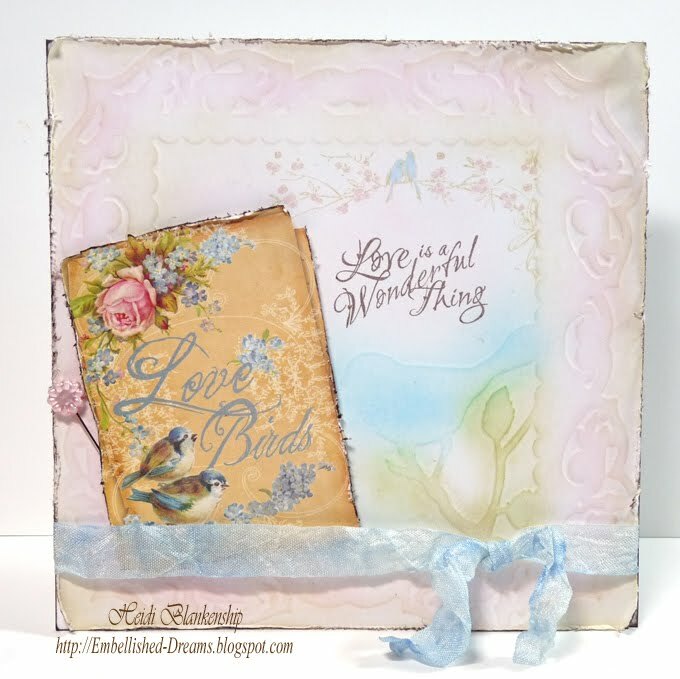 I LOVE the new My Mind's Eye 6 x 6 Paper Pads--they are so wonderful for card making! I added a Mini Crochet Doilie Flower Vintage from KaiserCraft and a My Mind's Eye Stella and Rose Hazel "Lovely" Decorative Brads to the center. I also did the reverse stencil technique on the border and accent piece. To create the border and accent pieces I used S5-042 Fleur de Lis Accents, S5-043 Fleur de Lis Motifs from Spellbinders™. Doing the reverse stencil technique will give you a wonderful 2 tone effect. 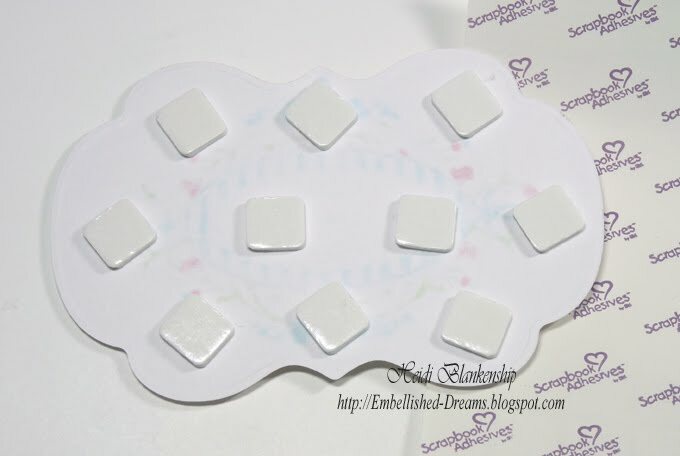 I also added some tiny pearls from Want2Scrap™ Baby Bling LeCreme Baby Pearls-100 Count. Please join me in visiting some of the JustRite Design Team Members. I am sure they will have some beautiful inspiration to share with you. Good morning! Today, some of the JustRite Design Team Members are showing sneak peeks of one of the New March Releases, Vintage Oval Labels. Vintage Oval Labels is one of the New JustRite Cling stamp sets. 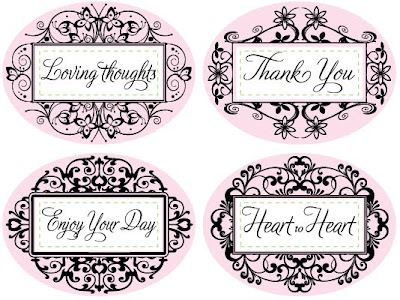 This set includes two beautiful oval labels, five accents and two sentiments. 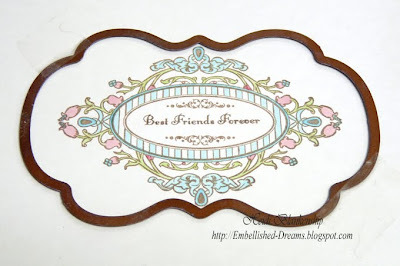 The large frame also fits JustRite Original Small Nested Sentiments and 2-1/4'' x 3-1/16'' Centers. 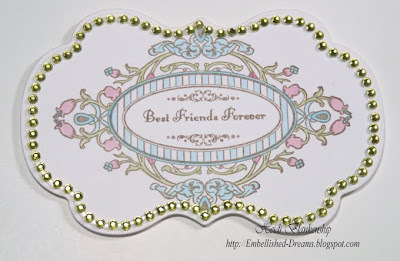 The smaller frame fits JustRite Original Mini Sentiments. I love it when you can mix and match the JustRite Originals with the JustRite Cling! Here is the card that I designed using the smaller oval label frame from the Vintage Oval Labels stamp set. 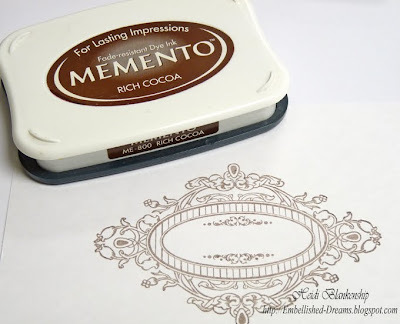 To start I stamped the image onto Simply Smooth White cardstock using Rich Cocoa Memento Ink. Next I colored the image with Copic markers. 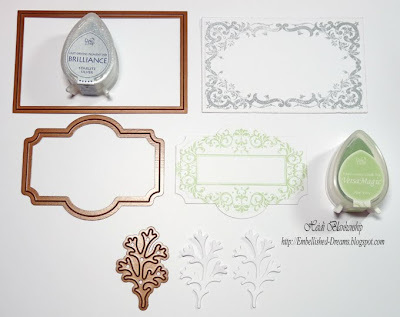 Then I used S4-290 Labels Fourteen #5 and the Grand Calibur™ from Spellbinders™ to cut/emboss the label shape. I taped the die template before cut/embossing for perfect placement. 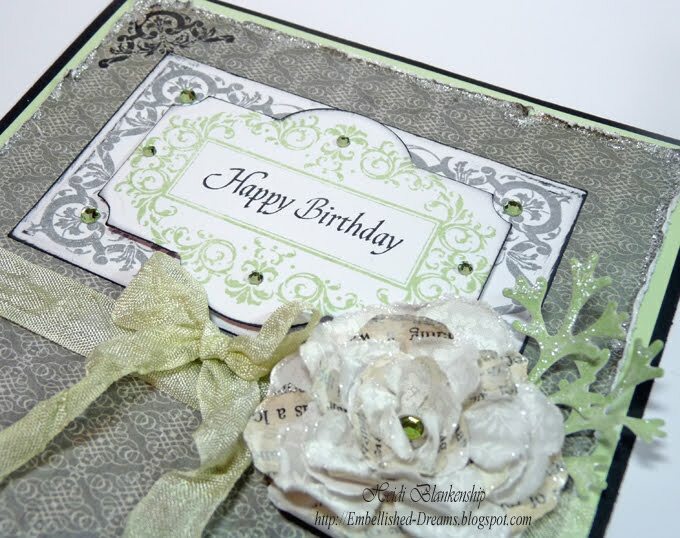 Next I applied Nestabling™ Labels 14 Lime Green from Want2Scrap™ around the label. Here is a close up of label fourteen with the Nestabling™ Labels 14 Lime Green. To create the card base I used Pretty Pink cardstock and LF-190 Grand Labels Four #4 from Spellbinders™. For the floral mat I used Fairy Tale Pink cardstock and S5-040 Floral Doily Accents and S5-041 Floral Doily Motifs. 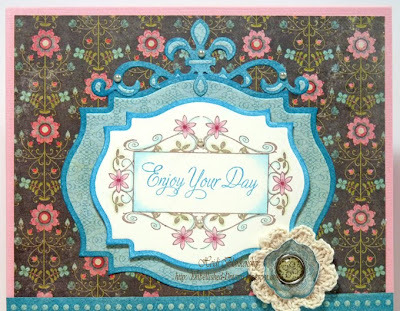 I used the large motif from S5-041 Floral Doily Motifs and the corner pieces from S5-040 Floral Doily Accents. Next I added 3D Foam Squares from SCRAPBOOK ADHESIVES By 3L™ to the label and then added this piece to the card front. Here is a close up of the label, motif and accents. I also added Baby Bling LeCreme Baby Pearls-100 Count and glitter to the inside space on the diecuts. I added some glitter around the outer edges of the card and Baby Bling LeCreme Baby Pearls-100 Count. 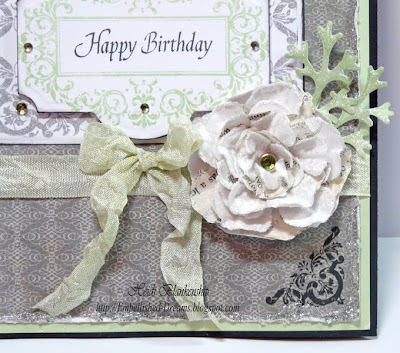 I added a bow and Prima ribbon to the top of the card. 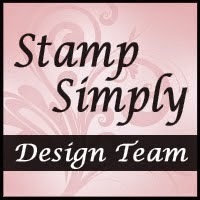 Here is a link list of some of the JustRite Stampers Design Team Members who have some cards to share with you today. What is Simply Sunday? Simply Sunday is a day for a little bit of simplicity in our lives and our journey as designers. No chit chat, no tutorials, no fancy techniques and only one or two photos. How did Simply Sunday come to be? While talking with a couple of friends we decided we wanted to do something different this year, something that would challenge us. 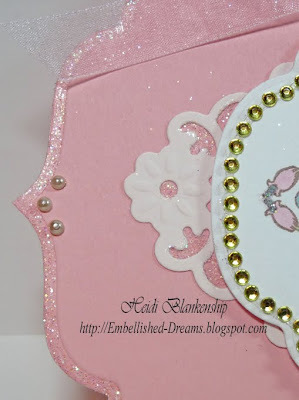 We each create and design with a LOVE for embellishments and lots of them I might add--LOL! So we thought why not challenge ourselves to create simple cards. Now, I know you might be thinking that doesn't sound like much of a challenge but sometimes creating the simplest of things can be one of the hardest things to do. If you would like to join us in our journey of finding simplicity in our lives and our creative designs please leave a link on one of our blogs--we would love to see what you create! Hello! 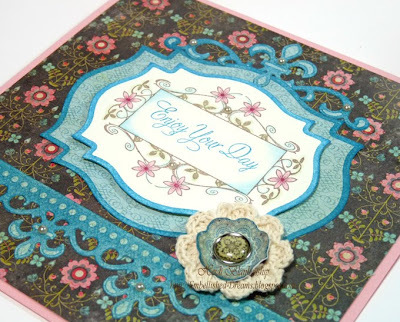 Today, I have a tutorial to share with you for the card I showed a sneak peek of yesterday. I used the Nestabling™ Labels 14 Lime Green and Baby Bling LeCreme Baby Pearls-100 Count from Want2Scrap to embellish my card. The Nestabling™ Labels 14 Lime Green from Want2Scrap matches S4-290 Labels Fourteen from Spellbinders™. To start I stamped the beautiful frame images from JustRite Stampers JustRite Cling CL-02070 Fancy Frames on to ivory cardstock. The CL-02070 Fancy Frames is a wonderful stamp set that includes 2 very detailed and beautiful frames, 5 accents and 6 sentiments for a total of 12 stamps in the set! Also, as you can see from the photo the CL-02070 Fancy Frames match S4-290 Labels Fourteen from Spellbinders™. What a perfect combination--Want2Scrap, Spellbinders™ and JustRite Stampers!! I used Peeled Paint and Worn Lipstick Distress Inks from Ranger on the frame. I used the Rock-n-Roll technique to create the two tone effect. 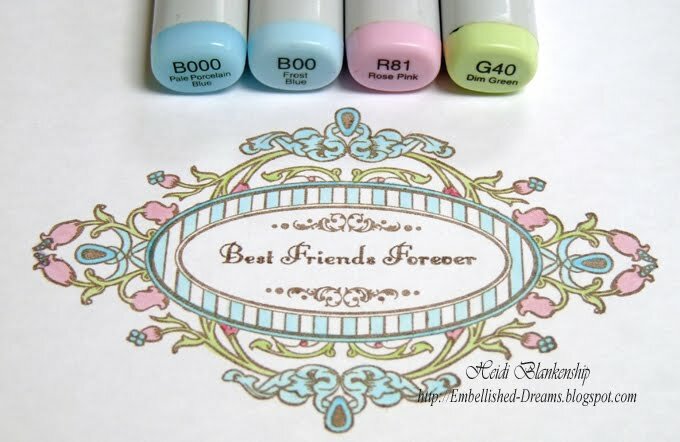 To do this simply ink the entire stamp with the lighter color of ink and then rock-n-roll the darker ink pad around the stamp. For the smaller center part of the stamped image I used Peeled Paint Distress Ink. 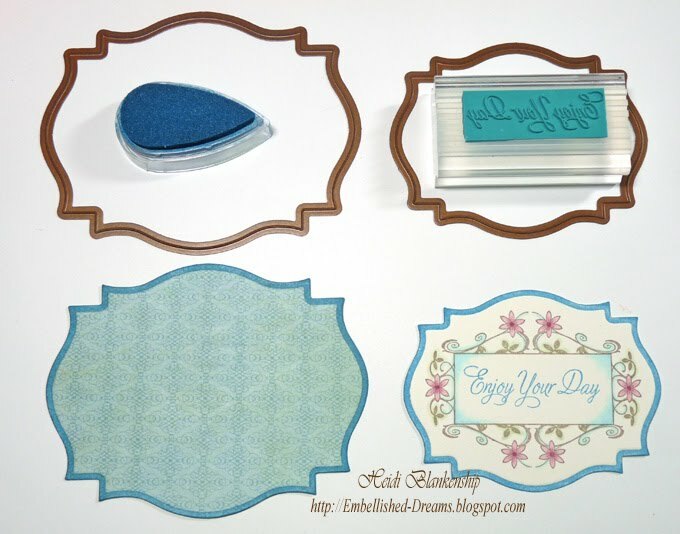 Then I used JustRite Custom Dies JB-08950 Nested Frame Dies (upper left) with the Grand Calibur™ from Spellbinders™ to cut/emboss the frame. 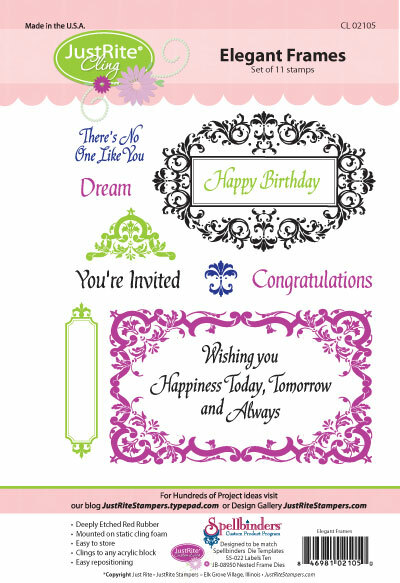 For the center image I used S4-290 Labels Fourteen #3 die template and the Grand Calibur™ from Spellbinders™ to cut/emboss the label shape. Once I had the frame die cuts done then I inked the edges using Peeled Paint and Vintage Photo Distress Inks. Then I added the Labels 14 Lime Green Nestabling™. 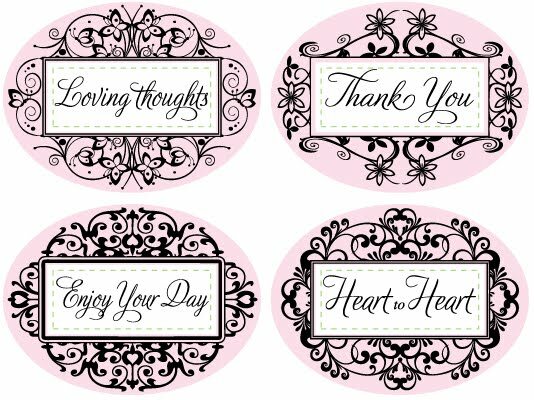 I also used S4-328 Foliage to cut/emboss a couple of leaves and used the same inks as shown above to add a little more color and then I hand cut the leaves. Here is a close up of the layered frames. Here is a close up of the rolled rose and leaves. I used the S4-312 Blossom Three #4 to create the rolled rose. Click HERE to see a tutorial on how I created the rolled roses (felt & paper roses). I added a decorative brad to the upper corner. Thank you so much for stopping by today! I hope you are having a Fantastic weekend! Please stop back tomorrow for something new--Simply Sunday. Exciting News!! Want2Scrap Design Team!! !